SINN FEIN AND United Left Alliance TDs have walked out of the Dáil in protest at the lack of debate over today’s €700 million payout to Anglo bondholders. The opposition TDs had sought a debate and a vote on the payout to the bondholders, but the government voted not to hold the debate. Gerry Adams then spoke in the Dáil chamber to say that Sinn Féin TDs were going to leave as a result of the lack of debate over the issue. ULA TDs followed shortly afterwards. Earlier Gerry Adams had repeatedly pressed the Taoiseach during Leaders’ Questions over why the State was proceeding with the controversial payment. Enda Kenny had defended today’s €700 million payout to Anglo Irish Bank bondholders, saying the government plan is ‘based on growth, not on default’. Speaking in the Dáil during a rowdy Leaders’ Questions earlier this morning, Kenny blamed the previous government for negotiating the deal. We are not going to scuttle this ship. Kenny also said that neither he nor the Government knows the name of the bondholders in the zombie bank. The Taoiseach faced fierce criticism from the leaders of the opposition parties who questioned him over the payout. Fianna Fáil leader Micheal Martin criticised the government for making pre-election promises to ‘burn’ the bondholders but failing to raise the issue with the European Central Bank during negotiations. Independent TD Shane Ross said that the government had a choice over what to do but that it had ‘decided to go down exactly the same road as was went down by the last government’. Ross also raised the issue of bondholders who had bought bonds in the former Anglo Irish Bank at a low price earlier this year, saying that such bondholders have made a profit of nearly 70%. Over €700 million ($1 billion) will be paid by the State today to unidentified bondholders on an unsecured five-year Anglo Irish Bank bond. 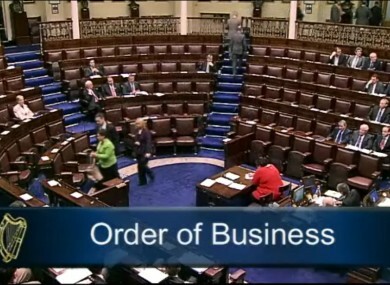 Email “Opposition TDs walk out of Dáil over lack of discussion on Anglo bondholders”. Feedback on “Opposition TDs walk out of Dáil over lack of discussion on Anglo bondholders”.